What is intuition? This is perhaps the simplest definition: immediate insight without reasoning. If we combine intuition and analysis we can make much better decisions. 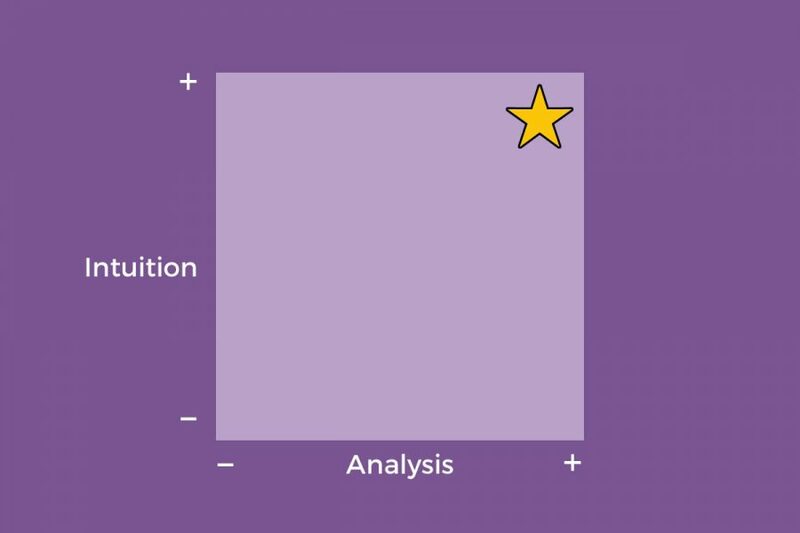 The gold star in the top right-hand corner of the diagram indicates the ideal combination of analysis and intuition. Not everyone uses the word intuition. Some people call it ‘gut instinct’. Others talk about ‘listening to your heart as well as your head’. In this blog post I will show you how to strengthen your intuition, which will be useful for hiring people, making financial decisions and much more. Those of us who think a lot – or simply have lots of thoughts – sometimes find that our intuition doesn’t work as well as it could. For example, I wanted to work in executive search straight after business school. However, having been immersed in economics, finance and strategy for several years, I seemed to be great at analysis but hopeless at ‘reading people’. Then one day, 20 years ago, I learned to meditate by accident. It felt as though someone had switched on a radar system. Suddenly I began to understand myself – and other people – much better. Within seconds of meeting someone, I would have ‘immediate insights’. A few months later I found myself in one of the world’s largest executive search firms, working closely with the chairman on board–level assignments. Fortunately, you don’t need to learn meditation by accident the way I did. I can help you get started right now. All you need to do is sit comfortably in a quiet place where you won’t be disturbed. You don’t need any fancy postures. Just sit upright with your back straight – so you don’t fall asleep – and keep your feet flat on the floor. 1. Set the timer on your watch or mobile phone so that it will ring quietly in 10 minutes’ time*. 2. Now close your eyes. 3. Place your attention on your breath as it flows in and out. 4. Every now and then your attention will wander. When it does, don’t judge yourself. 5. Whenever your attention wanders, bring it gently back to the breath. 6. Keep paying attention to your breath as it flows in and out. How did you get on? Have you noticed any changes immediately after the meditation? Please write your comments below. I will reply. *If 10 minutes feels like too long, you can start with five minutes.